Spray 4- to 5-quart slow cooker with cooking spray. Cut potatoes into eighths; place in cooker. Sprinkle with salt and pepper. Place bratwurst on potatoes. Top with sauerkraut. Sprinkle with caraway seed. Cover; cook on Low heat setting 6 to 7 hours. 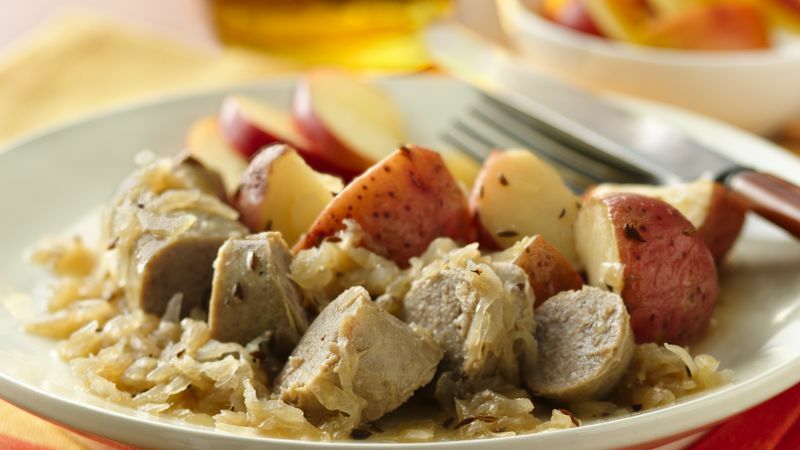 Remove bratwurst, potatoes and sauerkraut from cooker with slotted spoon. Serve brats in hot dog buns, and pile on the sauerkraut. Serve potatoes on the side. Top potatoes with sour cream, and sprinkle with chopped fresh chives or parsley.